If you’re a regular reader of Create Hype, you likely already know that blogging is an important part of your marketing plan if you’re serious about marketing your business online. Providing regular, high-quality free content using a blog is one of the most effective ways to up your business visibility, increase your search engine traffic, establish yourself as the go-to person in your niche, and get more people on your email list. All of which will help increase your flow of prospects, customers and sales. But running a successful blog that keeps readers coming back for more means consistently coming up with content ideas and publishing on a regular basis. The number one challenge I hear from small business owners and solopreneurs is that they simply don’t have time for that. 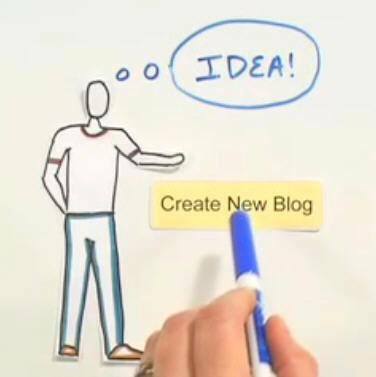 The way to overcome this challenge is to implement a content creation and planning system that will ensure lots of blog topic ideas and freshly published new content weekly. What you’re after here is consistency. It’s really a straightforward 2-step process: generate ideas, and plan and schedule content. One way to streamline the process of coming up with content ideas for your blog is to first determine your blogging goals. Is it to create leads, convert prospects into customers, build existing customer relationships, or position yourself as an expert in your field? Assuming the goal of your blog is to generate business (while at the same time demonstrating your creative genius, of course), you want to talk about your products and services in a way that inspires and instructs. So your blog is not a series of ongoing sales messages, but rather a hub for entertaining and instructive content about your topic area that helps your audience. See how that works? You’re being uber-helpful by creating content your target audience wants to read, you’re setting yourself up as a go-to resource in your niche, and you’re getting eyeballs on your products and services by way of your compelling content. Now when your readers are ready for a style consultation, they’ll think of you. Once you have your blogging goals nailed down, you can start brainstorming topic ideas. For me, this is the most fun part, and I bet for Create Hype readers, who are creative entrepreneurs after all, it will be too. There are multiple resources out there for generating topic ideas. Here are a few I recommend: blogs in your niche (look at posts that get the most comments to gauge interest), forums in your niche (same process), questions your customers and prospects ask, topics your blog readers and email subscribers ask about, and FAQ pages of blogs/websites in your niche. You can also set up Google Alerts in your topic area, or if you already have a base of prospects and customers, run a simple survey using one of the many free survey tools out there like SurveyMonkey, PopSurvey, SurveyDaddy, or even Google Forms, which will allow you to create simple or in-depth online surveys. Just keep in mind if you’re blogging for your business, it’s best to make your topics client-oriented. On Tuesday we’ll be covering the second step of this process: planning and scheduling your awesome content so be sure to check back! I think the best advice in here – and there’s lots – is that it’s smart to let other people give you ideas. Sometimes the thing you think is really interesting isn’t really interesting to everyone, so using customer questions or looking at successful blog posts is like deploying your own little focus group. Clever! I completely agree — alot of bloggers/marketers, including myself, want to know what content to create to best serve their audience, and think they’re doing that, only to find when they ask that the audience wants something else, or something more specific, or lots of times, the 101 version of whatever it is the blogger is creating content around.